Have you ever been on a diet only to find yourself craving a food that wasn’t included in the list of “allowed” foods? Or maybe you are just hit with a desire for chocolate or a burger and you ended up bingeing on a food that you know isn’t beneficial for your health? No matter what, you are not alone. Millions of people struggle with cravings on a daily basis. Unfortunately, most end up overindulging in these foods, which can cause long-term health issues. So, what does science say about why we experience cravings? And how to stop food cravings efficiently? In this podcast, I am with Dr. Elena Zinkov, the founder of the Proactive Health Clinic and author of the fascinating book, ”The Crave Reset.” Dr. Elena’s passion is the science behind cravings and she has made it her mission to help people overcome their impulsive reactions to food cravings. In this podcast, Dr. Elena gives us the dish on what science says about cravings and how to stop them. Is the claim “if you crave a certain type of food, eat it” true? Have you ever been on a diet only to find yourself craving a food that wasn’t included in the list of ”allowed” foods? Or maybe you are just hit with a desire for chocolate or burger and you ended up binging in a food that you know isn’t beneficial for your health. No matter what, you are not alone. Millions of people struggle with cravings on a daily basis. Unfortunately, most end up overindulging in these foods which can cause long term health issues. So, why do we experience cravings? And how to stop food cravings efficiently? Is the claim ”if you crave a certain type of food, eat it” true? Ari Whitten: Everyone. Welcome back to the Energy Blueprint Podcast. I’m your host, Ari Whitten. And today, I am with Dr. Elena, who is the founder of proactive health which is Naturopathic clinic and author of a fascinating book called ”The Crave Reset”. I’ve gone through a book. I think this is a, this is a really cool, fascinating concept that I think honestly, most people have been afraid to go into because it’s so complex. There are so many nuances and layers to this whole story around cravings and there’s so much kind of black and white, overly simplistic thinking that you’ll find on the internet around this topic that just isn’t really grounded in science. So, I first want to welcome you to the show Dr. Elena, and it’s a pleasure to have you. I’m glad we got to finally connect after meeting in person a few months ago. And I want to applaud you for having the courage, the kahunas, so to speak, to take on this, this really complex, tough topic of cravings and try and bring in evidence based lens to it. Dr. Elena Zinkov: Thank you. Thank you for having me. It’s a pleasure. Ari Whitten: Yeah. Yeah. So I’m curious, what’s the background story here as far as how you actually got into kind of being obsessed with cravings? Dr. Elena Zinkov: Yeah. Well the story goes back to when I was, I played semi professional tennis when I was younger. And as a female athlete, I know I struggled with making really good food decisions and I didn’t quite know how to eat for my body type. I didn’t know of the biology, you know, how to properly feel my body and my mind for optimal performance. And I ended up resorting to things that were basically processed, you know, really quick sources of fuel for me. But then I realized that slowly my body was breaking down and I was having digestive issues and skin issues. And here I am trying to plan a really high level of tennis and my body’s breaking down on me and I’m suffering through school. And so as I went after I stopped my tennis career when, you know, fall into academics. I realized that I was gaining weight, I was really unhappy and I was feeling that with food and I, and I’m sure that a lot of people can relate to that, that we sometimes use, you know, food is like a drug sometimes for people. And I was falling into that trap like so many of us do. And before I got into med school, I actually started to research more of this. How can I fulfill whether it’s like my sweet, salty or fatty cravings with something healthier and how can I still find the joy in the food? Right? But would that necessarily negative consequence is that so many of us go through and it’s been. Honestly, it’s been like over a decade that I’ve been on this journey where I finally saw what was working in my life as an athlete, as a student, as a parent in helping me manage my personal food cravings and I decided to write a book about it because I had this medical understanding that as you know, that the things that we experienced, I joked that I could’ve written about headaches and I would’ve taken the same naturpathic whole body approach to dealing with headaches. But food is such an emotional topic for people. It’s like religion, right? There’s so many opinions there. There’s just so there’s so much around food and it has such a huge emotional imprint on us that people really need better tools to understand where they’re coming from because, like you mentioned, the information online is really superficial and it doesn’t really go into that core of what our food cravings and preferences are all about. Ari Whitten: Yeah. Interesting. So, you know, I, as I was kind of preparing for this interview and structuring my questions, I have, I kind of ultimately decided I was just going to go by feel of how we kind of went into this because there’s so many different potentials kind of starting points to go down this path of creating. But I want to start with kind of this, this notion that some people have around the intelligence of cravings. Because I, I think that there’s a really good indication that sort of, there is a real need for bodies to have been designed with some sort of intelligent craving mechanism to make sure that we crave the nutrients we need. And so that there’s certainly layers of legitimacy there as we’re gonna get into. And we have lots of information online of people saying, you know, Oh, if your body craves this, it’s because you needed it. If your body craves sugar, it’s because your body needs sugar. If your body craves fat is because you need fat. If your body craves chocolate, you know, and, and so on and so forth. And so, you know, even with some people, some kind of in the intuitive eating community going really far with that logic and saying like, you know, if your body craves junk food, it’s because your body needs that junk food and, and so on. And then we have other people who just kind of leave cravings totally out of the picture and they’re like, go on this extreme diet. And yeah, you may have cravings like, you know, go on, for example, the super low carb carnivorous diet where you’re eating nothing but meat and if you have cravings for any sort of plant food that’s just a sign of pathology and it’s totally unintelligent and you should not listen to that and just keep continuing to only eat meat. Right? So we have this like that’s a pretty extreme spectrum of views. Now what you’ve done is you’ve brought evidence to this and you are kind of like understanding all of the territory in between those two poles of the spectrum. So I guess what’s your take on sort of the intelligence or non intelligence of cravings? When are they intelligent? When are they not intelligent? Dr. Elena Zinkov: I have so many clients have come to me because they’ve gone to a therapist who have told them, you know, listen to what your body wants. If you want to eat the whole cake, eat the whole cake. This is what your body wants. And that just does not make sense to me. It didn’t make sense in my mind. And I think intuition is a, it’s a skill that we develop over time and honestly, there’s a difference between intuition and an impulse, right? And so I feel like I want a piece of cake. I’m going to eat the cake. That’s more of an more of an impulse versus intuition is can I tune in into my own body’s wisdom and understand where is this craving coming from, you know, and so, and intuition is being able to understand on a deeper level, you know, all the different layers of health and wellness and psycho emotional and all of these different elements that are coming together. And so there’s a difference between intuition versus impulsive behavior. But I like science. I think there’s benefits to really understanding how the human body works and I always avoid the extremes because there’s only, there’s really only a small percentage of people that do well with extreme dieting and extreme lifestyle changes. And personally, whenever somebody has a craving that that’s a symptom that we need to pay attention to. Our bodies are telling, that we basically just need to pay attention and look at all the different layers that are involved. Because if you’re craving sugar, what I’m saying, even in the book, it’s, let’s check in with how your sleep is. Let’s check into what the possible reasons of why you’re craving sweet or salty or whatever that it is. Rather than being impulsive about it and saying, ”oh, I’m tired, I need sugar”. And actually I had a client I know. And throughout the book I share a lot of my real, real stories. You know, obviously names are left out of the book, but you know, sharing a lot of the real stories like my clients. She thought that the reason that she needed sugar was because when she would come off of the sugar, she would have these headaches. So she thought that it is actually sugar was good for her and going off of sugar made her feel horrible. And so the science behind that is that, you know, there’s, my education about is that of course, even in like Japanese cuisine, right? You have the savory, have the earthy, you have the salting that you have the sweet in the end. But if you look at even like Japanese desserts, they’re really small little cookies, you know, they’re like tiny little candies. It’s not like a whole pie or cake that people have. And I spent a lot of time in Japan and I really appreciated that about their cuisine is that they had a variety of things and you could have a little bit of this, a little bit of that and you kind of feel satisfied in the end. But even in my work is my client is that it was really this education component that you can have sweetness, you can have sugar, but it, it’s best to get it from natural sources like, you know, fruit and healthy sources of carbohydrates like sweet potatoes and squash and vegetables rather than depriving yourself from it. Ari Whitten: Yeah. Interesting. I know of a lot of people having a, having worked in the past with a lot of people who are trying to lose weight. It was one interesting experience that I, that I had with a lot of people actually once I experienced this for the first time and it shocked me and then I started kind of probing future clients that I was working with and I found out that it’s actually really common, which is a lot of people never experienced hunger. They literally are so used to eating you know, every few hours that. And they’ve done that for years and years and decades that they have forgotten what it feels like to actually be truly hungry. Yeah. Yeah. Like like to actually go without food for a long enough period of time and you know, maybe also be expending energy and physical activity that you get to a point where you feel that deep burning sensation in your belly that is like you, you’re, you’re, you know, your body’s telling you you need to eat some food right now we need to refuel because we’re out of fuel or we’re running low on fuel stores in Glycogenen. So on a, in a, in a way that’s almost kind of like the most prime, like the most central basic craving. Is it not? Dr. Elena Zinkov: Well, you know what’s interesting, I love it. I love the study of genetics around cravings because, and this is why I looped back to why a lot of extreme, extreme dieting doesn’t work because we’re all so individual and we’re also unique and you know, our genetic code, we have like 22 different genes that dictate our desire for sweets are our appetite, we know, sense of fulfillment or even, you know, energetic blueprint. And I had to say that, but, but so, you know, genetics are fascinating and that’s why I think whenever somebody applies whatever nutrition or lifestyle approach to their life, they have to understand that it’s going to be their own and they’re going to get a different response than, you know, than somebody else. And I definitely think that, you know, that one of the reasons that we have these, since we’re talking about the prime of reflex, and I do absolutely agree with you that people have lost their, you know, they’ve disconnected from what it’s like to go for hours without, without eating because food is in every corner. You know, there’s starbucks, a gas station, those holes with all of these sources of food. But genetically, like if we go back a couple of hundred years, like our answer answers does not have the same access to sugar and fat and all of these readily available products and foods compared to us. Like for us, we can prime it and we’ll get it in a couple of hours. Right? I mean, everything is just so easily accessible. So we’ve kind of disconnected from that primary reflex and, you know, the one thing that I do recommend, again, I don’t like the extremes, but I do recommend intermittent fasting because I see a lot of good benefits. Doesn’t mean that you have to do it every single day, but there’s something about kind of encouraging your body to regulate itself, to give it a break and to naturally put this in a fasting state where it can use a little bit of a glide kitchen, tap until a bit of the fat stores. Make the liver work a little bit harder, give your gut a little break, you know. But that’s an excellent point. Just about that people can have kind of lost touch with what it’s like to just not have access to something for like for maybe six hours, 12, 16 hours a day. And I actually so you know, like I did hot yoga before, it wasn’t even hot, hot yoga, you know, the, the trend. And I did Paleo and Quito before it became Paleo Quito and it has to do with my sports medicine background. But I’m also, I’m an Alpine climber, so I’m used to being in the mountains for 16 hours, 24 hours, you know, if you get lost, you’re going to be without food for at least 24 hours until you can get back, get back on the trail or until, you know, the weather changes and actually experienced such. I experienced both the negative and the positive aspects of Keto, you know, having trading, training Keto, being in the mountains in Keto mode I experienced the good and that you can run on sustained fuel for a really long time and be very, very much focused and aware. But then the whole trend about being on a Keto is what I’m worried about that extreme is that it burns a lot of people out. It burns out their genomes. And if somebody is already deprived, which is why I’m not a carbofobe, I’m not against carbs by all means. Right. And I’ve, I’ve looked at your book, but it’s like, I just think that it’s important to just understand that there’s a time and a place for those things and that you really have to understand the, how it impacts physiology in the long run. Ari Whitten: Yeah, absolutely. I agree 100 percent. So I think, you know, to be perfectly honest, I think that there has been one big stumbling block for me to really develop an interest in delving into the science around cravings and the reason that I maybe never did what you’ve done, which is that it’s, it’s kind of going back to what I was saying, the fact that so many people have never haven’t experienced true hunger, just basic hunger for food and so many years or decades. And there’s also this element of how the modern supply overrides kind of our ability to sense I’m properly, what our body is actually truly craving. Like we will have cravings for donuts and cookies and cakes and, and, and chocolate and ice cream and pizza and all these kinds of things. And if those, especially if those foods are in our immediate presence, we will feel a craving and an intense urge to go consume those foods rise up in us. It’s clear when you look at the overall data of nutritional science, you know, stating the obvious, we know that consumption of these foods is linked with very bad health outcomes and yet humans can feel a craving for that, for those stuff, those kinds of foods. And yet, we also seem to have the capacity for intelligence. Cravings were about, the body is genuinely communicating, ”Hey, you’re deficient in this nutrient and you need to consume more of this kind of food”. I think that in the modern world, though, just the modern food supply has, has kind of overwritten most people’s ability to actually be in touch with intelligent cravings. And there are more operating in this sort of, you know, their bodies and their brains have been wired into all sorts of unintelligent cravings that their body is being led down bad pathways. So how do you overcome that? And maybe you can speak to that in greater depth and sophistication than I can, but how do you help people overcome that and sort of get in touch with any sort of level of being able to draw intelligent cues from their body about what they should be eating? Dr. Elena Zinkov: Gosh, I can say so many things about that and you did such a great job of positioning that, that question and I think it’s wonderful. Nobody has asked me and on that level before and there’s a few things and I’m going to try to keep track of my thoughts because as you were talking, I had so many, so many things that came up for me so I’ll try to put it all together. But the things like the pizza, the cookies, the chocolate, the drugs, the alcohol, they all feel the same pathways in our brain. It serotonin and dopamine and we have come to associate those things as pleasurable activities and so every time we participate in the intake of the food or the activity, whatever that is, it creates a surge of Serotonin, which is the pleasure, pleasure neurotransmitter, and then you have dopamine coming from the other side and it’s what solidifies that behavior because from a primal standpoint, because I always talk about how we live in urban environments, you know, but our brain is still pretty primal. You know, it’s developed, but it’s still really primal and so the body wants to avoid pain and search word pleasure, and that is the point of Serotonin and dopamine in is that the body wants to continue to do things that are pleasurable and anything like not eating the cookie or not eating the pizza is kind of painful. I mean, people are irritated, right? When you take that away from them, people will get grumpy. They feel fatigued like you’re. You don’t feel good. And I, you know, I even mentioned in the book how that withdrawal symptoms when you take out the junk food can be similar when you’re taking out somebody who’s addicted on alcohol or any sort of drug. The symptoms can be really similar. Maybe not as, but very similar. And I think the reason why we are, we have this confusion in our ability to, because I absolutely agree with you, the body will let you know when there’s something is missing. And classically we know like a magnesium and chocolate, right? But there’s a difference between like Hershey’s kisses and like dark raw cacao powder, which not many people associate that like, I’m craving chocolate. That’s what I’m going to have. Right? They usually, if they have a craving for chocolate, it’s something else, a little bit more process that’s gone for manufacturing. All of that stuff. And I think that the reason why people are a little bit, not a little bit about, but really not in tune with what their body really needs is because of our broken food system, is that over the years from the time that we’re born and we’re exposed to so many different foods, we already have those neural pathways developed. Right. And so it can take time and I encourage people, you know, even in my book, I have the 14 day cleanse. Yeah, but it’s still going to take like 30, 60, 90 days to really start forming this new neural pathway so you can actually break yourself free and start developing a new palette for these things. But I really think that it’s the, you know, kind of like that magnesium analogy that when you crave chocolate it could be a magnesium deficiency. And there’s a reason why we have the research on magnesium wait to, to possibly like iron deficiency. I mean, sorry, cravings for chocolate tend to be iron and magnesium deficiency. But because we’re so we, our association is that when you tell the junk food to curb that craving, we lost touch with what our inheritability to really tell what it is, what it is that our body needs in the moment. Ari Whitten: Yeah. Yeah. It’s fascinating. So I want to I want to dig into some of this sort of other specific elements of what caused cravings. So you mentioned neurotransmitters, but, but I want to actually ask you something about a personal story and to see if this. You can understand this better than I can. A few years ago it was in the Himalayas trekking and when you’re, when you’re up there in the, in the Himalayas, there’s, you’re kind of going to different Sherpa villages and pretty much you’re eating a diet of basically nothing but lentils and rice and maybe a little vegetable curry, like some, some greens and some carrots and some potatoes with curry sauce, mostly rice and lentils. So after several weeks of this, my wife and I ended up traveling to India and we went to a coastal town in India called Arcola. A very pretty place. And you kind of have this walkway right on the cliffs above the ocean and right there there’s a bunch of restaurants with seafood and then most of them are serving seafood and they kind of have these big stands out front of the restaurant where they’re presenting all the fresh catches of the day. So after several weeks of being in the Himalayas, we were looking at this, you know, the first couple of days we got there and were like, wow, this looks amazing. Like just you crave seafoods so intensely to, you just crave being by the ocean after being up in the mountains, which is kind of a different level of craving. So like different environment. But on a food level it was this intense craving for like seafood. I need to get food from the ocean in me. And so that was there. We ended up like maybe the second night there was a huge thing of prawns laid out and they just looked amazing and we’re just craving them so intensely. So that night we were gorged on prawns. We ate a ton of these tiger prawns, like just a mountain of them and I remember the next day walking by all of these stands where the restaurants were and seeing platters of prawns laid out and actually feeling like a sense of discuss like almost a design like nausea, like desire to vomit at the thought of having to eat any number of prawns. It was like my body was screaming at me. You do not need to eat any more prawns for awhile. So it was to go one day to the next from an intense craving to like repulsion was very interesting and I’m just curious if you have any insights into that. Dr. Elena Zinkov: No, I think what you’re talking about is that classical, that there’s a time to feast and there was a time of famine and what you experiences that you were checking in the Himalayas and you didn’t have as much of access to those readily available sources of protein as you do on the coast or anywhere or like even back at home. Right. So one is you really had to replenish, had just had just done attract right in the Himalayas. Seafood, you probably needed some iodine for your thyroid, but I think it’s just, and this is what people miss these days is going back to not being able to, you know, going back to the primal reflex of eating and feeling the hunger and depriving yourself of something for an extended period of time to finally getting back to. I’m getting back to being exposed or certain food, food element, a food group that you haven’t had in a little while. So I think there’s multiple factors in place. So when you experienced at the feast or famine, right, is that when you’re in Himalayas you only have access to some delicious and lentils and some rice. Mostly a high carbohydrate diet, right? Don’t have access to too much protein too. You’re probably deprived and you need to replenish whether it’s like you know, your amino acids, muscles, all of that stuff just to replenish your body. But I think three from nutritional perspective is that there are probably some nutrients that are frequently found in seafood, like iodine that you absolutely needed to replenish and probably some omega three fatty acids as well from the fish as well. Ari Whitten: Yeah. Yeah. I think you’re spot on. I also, my hunch was always like maybe there’s some specific compounds in shellfish, iodine, selenium or some concentration of some of those, those minerals that my, my body seemed. It was almost like my body detected that it was, had excess amounts of those all of the sudden. And then it went from deficiency to excess amounts and it was like you don’t need to have that for awhile. Dr. Elena Zinkov: And sodium as well between like seafood frequently when you have a thyroid deficiency or thyroid dysfunction, people will create salty, salty foods. And a lot of times seafood, for example, you know, high in iodine, selenium and then also saw that the association between like you can see me right has assault and the iodine in it as well as sodium. And so but it also has a really protected mechanism as well, you know, from that, the seafood in terms of the, when you go through a long, a long period of exposure to stress, whether it’s physical endurance activity, right then that creates a lot of oxidative damage in the body. And so, and that can actually like taking when somebody is compromised with the thyroid function, that’s why you get on with just a little bit of iodine, right? Not to throw into thyroid storm, but a limited that protective function for the thyroid. Ari Whitten: Fascinating. So you mentioned kind of the neurotransmitter layer of cravings, serotonin, dopamine, and kind of how some of those pleasure pathways can be rewired or overwritten by the modern food supply. What are some of the other layers of factors that affect our cravings? Dr. Elena Zinkov: So yes, then neurotransmitters as hormones, classically thyroid, adrenal dysfunction. And then of course digestion. So I came across such fascinating research when I was writing this book because I, you know, we hear about gut microbiome and how it affects our mood and depression and anxiety and our unity. And then I came across as I was doing some research for the book that the foods that we eat actually caused population of certain gut bacteria and that is the cravings that we experience, particularly for carbohydrates are for cheese or for some of this processed food is actually based on the type of bacteria that we have. And I can’t recall the specific name, the gut bacteria because, you know, they have such long names and there are so many of them. But that was fascinating to me and that you know, that there is, that there is science and there is research that they’ve done studies that people would, certain cravings for certain foods. There’s a direct correlation for the type of good gut bacteria that’s done that predominates. And I, since I do a lot of guts stuff in my clinic, I always like to take a look at if there’s any gut dysbiosis happening with people because the foods that we eat, especially if there’s a standard American diet high in processed carbohydrates that can create gut dysbiosis and that I, you know, then you start to creating more of those foods because then you have the gut bacteria that is essentially trying to create an environment where it’s trying to thrive and it’s releasing chemicals, your transmitters and hormones to make sure that it survives by giving you the cravings so that you eat the food in order to sustain it. So that was one of those, like a fascinating thing for me to find. Going back to the neurotransmitter level, I just wonder how much you then have, you know, just as you’re talking about these people are kind of the bacteria’s craving causing them to crave eating bad foods in order for those bacteria to get the stuff they like that selectively feeds them. I wonder how much also people are being wired out of eating the foods that they should be eating by virtue of kind of linking unpleasant, painful experiences to eating some of those beneficial foods. Dr. Elena Zinkov: Yeah, precisely because you know, you eat the bad food, refuse the guy bacteria and then. But you’re also perpetuating Serotonin, the dopamine cycles. So you’re kind of in this vicious cycle and that’s why I’m always for you got to cleanse yourself. You got to cleanse yourself from the junk food. You got to get rid of it for a little while. And you know, in my personal story, I think people get discouraged really frequently. They try something for a week or two weeks and they’re like, well, this doesn’t work, you know? But the thing is that we all know that health requires really sustainable action day in and day out, and I think so many times people get discouraged and that they don’t see something working really quickly and they give up on that. And I say like, even in my own personal journey, when if you read the book, I could easily down a cake easily, you know, it was like because I was hungry and that seemed like a really good fuel source and it was organic carrot cake that seemed like a good idea, but it took me a couple of years to really rewire those food cravings to cook more in the kitchen to make own raw treats and Paleo treats. And but that effort that you put in is, is just like, it is so, so necessary. And you know, 80 percent of Serotonin is actually produced in your gut from beneficial good bacteria. But if you have, you know, I kind of calmed the [inaudible]. Like if they’re dominating the scene, then you’re not producing. No. All they’re doing is creating all this fermentation and not producing the Serotonin then they need to be. And so you’re really like gut health is really important. Ari Whitten: Yeah. Yeah. Interesting. So you mentioned chocolate and magnesium cravings. Are there any other examples that are kind of well spelled out in the scientific literature around, you know, where, where we really have strong evidence that cravings for this specific, where that specific food are linked with this specific deficiency. Dr. Elena Zinkov: So the other one was iodine, iodine and seafood and seaweed. Um, so there’s some evidence on those particular. I’m trying to think of the other. Alright. Cheese and chromium deficiency. That’s another one. Ari Whitten: People not cheese deficiency though. People with chromium deficiency will, will tend to crave cheese. Ari Whitten: Or it could be a cheese deficiency. And then you crave chromium supplements. Ari Whitten: the limitation there is more just a function of the fact that there haven’t been many experiments into testing that, I would imagine. It’s not that, you know, there’s been hundreds of studies testing, you know, the link between cravings and specific foods and they just haven’t found them as I’m under the impression that it’s more just that there haven’t been very many studies even probing those questions. Dr. Elena Zinkov: Yeah. There really haven’t been in it. Just like for me, even in writing the book I am, it was really interesting that the studies that I’ve seen, of course all those studies would say know more research needs to be more research needs to be done in this and more research. And I tried to find studies that were really good with high quality but I think it all came down to really providing people with really easy, easily applicable tools and they can do on a daily basis to provide them with things that they’re craving. And healthy alternatives to that to satisfy that craving and just give him a little bit more insight that possibly there is a nutrient deficiency, but more often than not, it’s just not, it’s not, it’s not just a nutrient deficiency. It is this combination of so many different symptoms that play into our lifestyle, our gut and our health. Because in the end, like even in the client, the clients that I see really high stress, will it really top performance, the top performance and the reason that they crave the processed food or the junk food is because their adrenal function is tanked. I talk about cortisol. Cortisol is what regulates your blood sugar. One of the things that regulate our blood sugar and when your cortisol levels are low, it’s really hard for you to get your blood sugar up. And so you ended up resorting to things that are provided that instant fix. Ari Whitten: Gotcha. I have another weird one for you. I read in an article recently on the current carnivore diet. I don’t know if you’ve heard of that, but it’s basically an all meat diet with essentially no plant foods. Um, or very close to no plant foods, someone was saying that you know, that one of the things that the diet may promote is scurvy, vitamin C deficiency and that we have, I didn’t fact check this, I didn’t actually go to see if there was, you know, research supporting this or not, but this researcher was saying that people, when they’re on vitamin C deficient diets that are going to kind of promote scurvy, they will start to get cravings for citrus fruits and sort of this very specific craving like our, our biology seems to be wired with some sort of knowledge of what contains vitamin C and you will experience, you know, basically you’re saying the people on all meat diets or at some point going to fail to adhere to that diet. And, just like all diets, there isn’t 100 percent adherence rate. People will deviate here and there. And he was saying specifically they’re going to probably deviate by consuming by feeling this compulsion to go eat oranges or grapefruit or some, you know, other citrus fruit. Have you ever heard of something like that? Dr. Elena Zinkov: I have, and I think it also comes down to I think psychologically we’ve kind of program that vitamin C oranges, right? But if we think about other sources of vitamin C, like it’s not just [inaudible], right? There’s so many other plant foods that you wouldn’t even think about that have high vitamin C, but they do, but I think it’s not just but I think the reason one of the reasons that they mentioned in particular is because you’re primed to, to go for the citrus foods. When we think about why I didn’t see no, that that particular craving is vitamin C, but I think the best thing that your body knows, like you can think about it, your body may be deficient vitamin C, but it’s going to go for citrus because that’s what he knows best. That’s, that’s what it’s been programmed to know is what contains vitamin C compared to other food sources. Ari Whitten: Yeah. Interesting. What about the idea of like carb cravings for people on Super Low carb or keto diets or, or stop cravings for people on Super Low fat diets. To what extent do you feel those sorts of cravings are legitimate? Dr. Elena Zinkov: Well, I think carbohydrates are an important fuel source and it’s all about the quality of our carbohydrates. So I frequently say that like if you’re craving carbohydrates, there’s, there’s a reason to like your, we need carbohydrates for like jen or it’s just simple energy source or us. We need carbohydrates. They’re most carbohydrate. Rich foods contain key vitamins and minerals. So even when you mentioned, you know, the Carnivore Diet and [inaudible] vitamin C, it would be one of the things I would worry about. I would worry about all the other nutrients that you’re depriving yourself of by just being on a meat diet. And so, and a lot of really wonderful nutrients are found in carbohydrates. So I think that when people crave carbohydrates, it’s honestly, I think that there it’s not just a carbohydrate itself as an bread crackers or something like that, but certain vitamins and minerals that those things contain. It’s again, it’s just the programming, right? Dr. Elena Zinkov: so you know, fruits, apples, pears, vegetables, broccoli, brusselsprouts, kale, mixed greens and sweet potatoes, squash, asparagus, so really emphasizing vegetables and even old grains like brown rice and some that ancient grains. Those are all healthy source of carbohydrates and you can load up on those sources of carbohydrates and reprogram yourself to crave those foods instead of junk stuff. Right? Like the processed white bread or wheat bread or crackers and I’m white rice and all of those more highly processed foods and thinking with that. I think that there’s the problem is not in the fat. It’s the quality of fats and we need fat to make our hormones and we need fat for our cellular integrity because cells we have. We’re made of billions of cells and each cell has this beautiful border around it to a protective order made out of fat and fat for that. But there’s also bad fat, there’s good fat and things that are highly processed like soybean oil, vegetable oils, canola oil, and then the Omega3, I’m sorry, Omega fatty acids that are commonly found in meat, again in moderation, I believe in a balance between Omega three, six and nine. But I think people tend to focus more on, tend to get more of the 6 and the 9 fatty acids and not so much omega 3 antiinflammatory fatty acids. So it’s not even like the low fat but the quality of fat. So, and we need fat, you know, for, for nervous system, for brain function. It’s um, I think it’s natural for people to crave fat when you go on a low fat diet because it’s just the carbohydrates. Fat is involved in so many different processes. Dr. Elena Zinkov: I came across a couple studies that I wasn’t really dove into more of the psychology of cravings and the environment which I wasn’t actually really familiar with until I started to write the book and things like that face, for example, the the layout of tape of tables when you walk into a, like a buffet or even the whole foods hot bar, like the positioning of the food and the container for the food. All of those things can impact how we perceived the amount of food that we may be needing or craving. That’s one thing. So they actually, even things like lighting can impact our craving. So right light versus dim light music can impact our cravings. So there’s so many. There’s all these factors which made me think about how, like, how restaurants operate and how in certain in certain areas it really ties into our psychology. But I think the other really big part in about environment is our social environment. And this is where I see have seen a lot of people struggle is what’s happening in their work environment. And I still don’t get why corporate offices have like candy jars everywhere. I don’t get it. Like I had one of my clients and she actually has a binge eating disorder and we worked with her for a number of years and she said, ”Elaina, I’ve come so far to have, just to be more in tune with my body and to understand that if I haven’t an impulsive desire that is, that’s all it is, just an impulse that I have to act on it, blah blah blah”. So there’s so much that we went through, but she goes, you know, it’s the holiday season and people are bringing cookies and baking stuff and there’s candy everywhere. And I’m like, that stuff still exists in corporate America? Didn’t they get the memo that sugar is bad and that we need to protect our employees from it or something like that, you know. But so there are social environments and the pressures from the social circles. So like you go out to eat. I used to feel bad about this, but you know, I would be like that annoying person in the restaurant, like I’ll have you know, this without that and with a side of this and when it came to own that because that’s what works for my body and I really don’t care anymore if people think you know, about my preferences and I kind of teach people that you’re going to get resistance when you go into your social circles. Like if you say I’m going to pass on the alcohol or I’m going to pass on this or I’ll have a side of that that prepared to get some resistance and it depends on if you’re willing to kind of stood up for what you believe in and what’s really good for your health or in other people’s agenda. And so, but so that, that social element, that peer pressure, you know, to eat something, to drink something and also just the exposure that a lot of people, you know people get exposed to the different other people’s food preferences at work or whatever. Whatever’s in there on the refrigerator. So that also ties into the whole environment concept, so a lot of times to educate people about what to bring with them to work, what to stash at their desk, how to say no, you know, it’s crazy as it sounds. But to teach people how to save. Ari Whitten: Yeah. Well let’s, let’s segue into that. I want to talk about some practical solutions to, to cravings sort of issues. Let’s, let’s start with that one in particular. So let’s say somebody works in an office environment, there’s other employees in that office who are bringing in plates of chocolate chip cookies that are filling the air with that beautiful chocolate chip cookie aroma that everybody will intuitively want to seek out. It’s like, you know, as soon as you smell hits you, it’s like Whoa, I need some chocolate chip cookies. So what, what do you recommend somebody does in that kind of environment to combat that craving that is leaving, leading them in a bad direction? Dr. Elena Zinkov: A couple of things. One is don’t be, don’t be caught off guard. So if you’re walking into, and this is kind of a grounding ourselves, so if you walk into an environment and you’ve totally caught off guard, like maybe you skipped breakfast, maybe you just got done with a stressful conference call and maybe you’re not in the best of moods. So if you’re caught off guard and you’re walking into the situation, then it’s all fair game, right? Most likely you’re going to given into that chocolate chip cookie smell and you’re going to partake in a chocolate chip cookie. And so something that I recommend is be sure that you’re not caught off guard by making sure that you have all the checks and balances in place. Keep your blood sugar stable, right? So if you know that you’re somebody who tends to be an impulsive eater. So like for me, I’ve trained myself not to be an impulsive eater. So even that cookie smell is not going to get the best of me because most likely I’m not caught off guard that I had something healthy to eat before I walk into my office or even if I am, if I’m caught with that, that desire for the cookie have something alternative on hand, so something that can satisfy that craving without the negative consequence of the cookie. Because what happens when you have one cookie, chances are you’re probably gonna have a second cookie cookie, and that’s where I’m like, there’s nothing wrong with having just one cookie, but that’s not where people stop. The issue is not in that one cookie that you’re going to have. It’s in the course of the day, how many cookies you’re going to have in the course of the meal. Ari Whitten: interesting neurotransmitter layer of this. What are some strategies that people can start to implement to, to fix what’s going on in a neurotransmitter level? Dr. Elena Zinkov: One of the things I recommend is actually eating healthy carbohydrates, so getting that similar but not exactly with things like healthy carbohydrate sources like I mentioned, the vegetables and the squash and things that because what happens is like there’s a difference between eating, like licorice twists, right? And versus a sweet potato. Sweet potato has its sweets, but it also has a lot of great sources of fiber and vitamins and minerals. Whereas the licorice twists, for example, has just a bunch of sugar and chemicals and it, that’s all it is. And so you might get an and it’s the the amount of the serotonin surge. So because the sweet potato has that additional fiber in it compared to just like a piece of candy, you’re still going to get that little spike in serotonin, which is going to give you that pleasure without the. But it’s not going to be as big of a serotonin surge as it would with the candy. But still you’re going to get that satisfaction from having something that like a healthy carbohydrate. So just for, for Serotonin in particular, it’s really, I’m finding satisfaction in other stores or fueling serotonin with other forms of carbohydrates. And then of course supplement wise 5HTTP, it’s a serotonin precursor. You can find it anywhere really these days, but it can be a really nice and natural way to support serotonin national search, one in production so that because genetically some people produce less Serotonin, just some people I produced less serotonin compared to other people and therefore I need to pay closer attention to my diet in order to avoid the ebbs and flows throughout the day that they can experience him a blood sugar and my mood. Um, and then supplementing with five htp, she just helped to promote those nice healthy serotonin levels. Ari Whitten: What about dopamine, is there any aspect of addressing the dopamine layer of this as well? Dr. Elena Zinkov: No, dopamine is mostly behavior, so this is why I recommend intervention. So a lot of impulsivity in particular is really breaking that habit loop by going for a walk around the block, the stairs, getting a little bit of an endorphin boost, really finding activities to satisfy, not necessarily to satisfy a craving, but to break that cycle. So dopamine is mostly like get your body into a different environment to start breaking that bad habit. And this is what I talk to people about. Maybe it’s meditation, maybe it’s going for a walk outside, maybe it’s incorporating a short workout at your depths or whatever. Who Cares? Like if anybody’s watching they’re just jealous they wanted to be doing squats and lunges with you. But also the key nutrient is… which is a precursor for dopamine that also some people can be just genetically predisposed to producing less dopamine. Ari Whitten: Interesting. Are there any other sort of areas of strategies that you think are important apart from the sort of Serotonin, dopamine layer of the environmental layer is, is there any other aspect of this that you think needs to be addressed? Dr. Elena Zinkov: I think mindfulness is a huge, huge component. I think many of us are in a go mentality all the time that we kind of forget to justice. We forget to fast from food because we always just eating. I think we forget to just pause sometimes and to really reconnect with ourselves and understand are we really, I’m in a fight or flight mode or are we safe and are we making a bigger deal of a situation than it really didn’t. It really needs to be because the tendency for our brains to magnify things, right. Again, it’s a really protective mechanism and I think I’m having a mindfulness practice. Something that you can just give grounded in can be really helpful in identifying as something are you, are you hungry, are you frustrated, are you bored? And kind of really understanding what that impulse or that craving is really about. So I think mindfulness is number one and multitasking, right? There’s no such thing as multitasking. You can only really focus on one thing at a time. And so one of the things that I talk about is having some structure to your day. When are you eating? What are you working? It’s just kind of having those two things separate is because I think when you’re working, when you’re eating, you’re actually kind of, you’re trying to avoid some aspects of your work because the eating is giving you pleasure, right? As you’re constantly studying, right? You’re kind of like, you’re eating and you’re studying, you’re eating, you’re studying and, but it’s what is that having a snack at your desk? What is it trying to distract you from? So really practicing presence and mindfulness. Ari Whitten: My final question to you, going back to something we talked a bit about earlier as far as people not knowing what hunger feels like anymore, and people kind of have being wired into this mode where all of the cravings that they’re experiencing, our cravings, driving them to do things that are associated with bad health outcomes. So in other words, craving donuts, cookies, crackers, pizza, ice cream, that sort of thing. Um, so there’s an element for someone like that that they, they just, they’re not in a position where they can immediately start trusting their cravings through body’s cravings. There’s to some extent, it’s a skill to to be able to listen to your body’s cravings and to actually have intelligent cravings that you can act on in a way that is ultimately beneficial to you. So it’s a skill that has to be cultivated and also like there’s a biological biochemical level of your body has to be actually in a healthy enough state that it is communicating good signals instead of pathological signals. So how does that transition process look? Is it basically just a matter of eating pretty much an entirely whole foods diet and then the system’s kind of reset in a way that your body starts communicating a good intuitive craving signals? Dr. Elena Zinkov: Yeah, absolutely. You know, the body inherit and these are really resilient machine, you know, we just get out of its way. It’ll do its thing. But I think what happens is that over time we do no damage to it, that we kind of forget what feels good for us. And it all starts with doing a cleanse and doing an audit and seeing what works and what doesn’t work and really focusing on introducing the foods that our body knows as, you know, as medicine really ask and absolutely a whole foods diet. And I think the tendency is for people to go to the extremes is that, okay, I’ve been eating junk food now I’m just going to go full on Keto. But the big problem with that is that people don’t usually know how to offboard of that program. If they go Keto, they go, you know, just start eating meat or whatever we decide to do face sometimes the biggest problem that people have is not necessarily starting, but coming off of that and being really strategic, super strategic about it because it’s like you and I are in medicine or in science and we kind of know how to ease our way out of that. And we guide our clients how to do that properly. But, but, but most of the time people are preoccupied with other tasks in their day, you know, and just support their family. And so they don’t, they don’t have time to do the proper research or don’t have access to the right information out to come off of those extreme diets sustainably. And they ended up what I call the rebound effect, basically pendulum back to where they were before and then be frustrated. So the reason why I liked just the whole foods approach is because it’s sustainable, it’s easy, it’s not a big stress on the body, we’re not asking you to do crazy things. We’re just asking you to eat foods that are not all packaged and fried. Right? And that are super inflammatory. So, and, but it takes time. And that’s why, you know, in my research what I’ve, what I’ve found is that it takes at least 90 days to fully start getting the benefit of those neural pathways of developing those new neural pathways to really see that, oh hey, wait a second. I’m not as dependent on that thing as it used to be for. So you know, you’ve got to give it some time. But really, you know, the, the, the foundations of health with the movement or the exercise, the sweating, in a whole foods diet can just do wonders, but, but it, but it takes time and you have to be able to do it in, within also changing or modifying your lifestyle because if you have high amounts of stress, we need to make sure that you have the tools to help you manage the stress better. So, I shared my experience of becoming a mother in my book and how, you know, I’m really good about my guide. I’m really good about my exercise, but in a constant of a hormone imbalance that I experienced postpartum, it was like all those things went out the door and I was craving foods that I haven’t craved in a decade. And I was relying on more caffeine than I normally would. And that was even an at. That’s at the same time I was writing the book. So literally as I was writing that story, I was going through this and I was trying to figure out, you know, how to heal myself. And, and that was a, and that was a moment of insight and that we got to have those other things. You got to have those ducks in line as well. We’ve got to make sure that our hormones are functioning properly so that they’re sending the right signals to ourselves. We have to make sure that we’re managing our stress, our relationships, and how we respond to those relationships into the stressors and, you know, of course, address the diet component as the foundation of it all. Ari Whitten: Awesome. Well, Dr. Elena, I’ve really, really enjoyed this conversation. As I said at the beginning, I applaud you for having the Kahunas to, to explore the science around this very, very complex, nuanced and complicated topic, and I love your book. It’s great. I highly recommend everybody listening, who struggles with cravings and wants to understand them and have practical solutions for fixing some of these cravings that are, that are problematic in your life that are leading you down bad pathways of how to fix them. It’s, you know, goes into greater detail than what we covered in this, in this interview. And I highly, highly recommend it. It’s called ”The Crave Reset”. You can get it on Amazon.com. And Dr. Elena, do you want to direct anybody? Did you want to direct people to any place in particular to follow your work or learn more about you or if they want to work with you or someone in your clinic? Dr. Elena Zinkov: Yeah, so they can find in two places on my website, https://proactivehealthnd.com/. And then I’m always on instagram sharing tips and tricks and videos. So you can find me on Instagram, Dr. Elena Zinkov. Ari Whitten: Wonderful. Thank you so much. It was such a pleasure and I look forward to talking to you again soon. Dr. Elena Zinkov: Thank you. To work with Dr. Elena Zinkov, go check out her website. 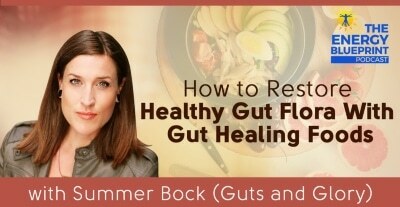 In this podcast, Summer Bock shares how to restore healthy gut flora.